Now with fold over yoga waistband! Teen and Women's version of the popular Willow Ruffle Pant. 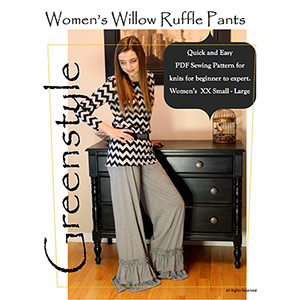 Make these flattering ruffle pants with stretch knit in stripes, solids, or prints. Included is a step by step tutorial with pictures for the beginner to expert sewist. Sizes XXS to L. This is a full pant so if you fall between sizes, size down one size.